Readers can sign up for occasional news from Hodder & Stoughton by sending email details to: http://www.lindseydavisbooks.co.uk/. My UK publishers run a Facebook page for me to sneer at, but John likes it, so he has linked my website to it if you enjoy such stuff. Note: I can now only undertake events where the travel is suitable and expected numbers are good. I’m sorry but events may be cancelled if there is not sufficient interest beforehand. Books are usually available for sale and I will happily sign new ones but please be considerate about older editions. (My handwriting tells its own story…) It is also polite to remember that our hosts at the venue are holding events in order to sell new stock. Saturday 23 February – 5.10, Crime in the North East Festival (a new festival in Newcastle), King’s Hall, Armstrong Building, Newcastle University. Talk and signing. 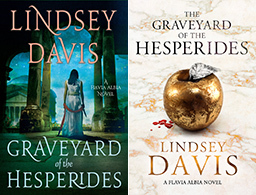 19-24 November– Andante Travel Lindsey Davis tour in Rome. Assisted by a professional archaeologist, we shall visit some sites from the Falco and Albia series and Master and God; I shall be with the group throughout the trip. I’ll discuss using ancient Rome in my books, give evening talks and personally guide one of the sites. For details and booking see the Andante website. Note: This itinerary will be slightly different from the previous Rome tours, so people who went in 2018 may even like to come again. We try to make it a suitable taster for people have never been to Rome before, or those who know the city but want a trip with a special emphasis.